I wrote this book urged by the overwhelming desire that arises towards the end of life to recapitulate the past. My goal was to summarize my experience of practicing science at the end of the 20th and early 21st centuries in Argentina, a country located far away from the world's leading scientific centers. In the book, I summarize the intricacies of the pineal gland ("e;the stone of madness&qu… ote;) as historical, mystical and medical entity and its entry in contemporary medicine with the description of melatonin. I also reflect on how being associated with an unexplored subject at the beginning of his scientific career impacts the life of a scientist throughout their entire life. Today we know that in humans pineal melatonin is released every day late in the evening, and there is evidence that it is the trigger for the sleep process. But the most exciting aspect of melatonin is that it is a substance that is present in all living creatures, from unicellular organisms to plants and higher mammals, a fact that evinces its importance for life. Further, the neuroprotective action of melatonin promises to be crucial for the control of neurodegenerative diseases we face as a pandemic in this century. The discoverer of melatonin, Aaron Lerner, based its name on melano, the Greek word for black, because of its effect on the pigment cells of the skin. 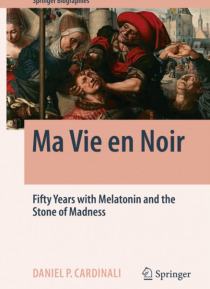 As in "e;La vie en rose"e;, the immortal Edith Piaf song written in 1946, my lifelong work with melatonin could well be called "e;Ma vie en noir"e;.